Invicta IT Solutions provide an online backup solution which is a fully automated online data backup service. This service allows you to select all important company data stored on your servers, or PC’s, which will then be uploaded via your internet connection to secure servers at a remote location away from your business premises and at a time most convenient to you. Affordable. With prices starting from £5 a month, the cost of protecting the most critical files is tiny compared to the risk of losing that data. Remember, 50% of companies that suffered a major data loss went out of business within two years. More secure. Most SMEs still use tapes or removable drives to backup their files but they are notoriously unreliable. Recent Gartner research found that half of attempts to restore all data from tapes after a major server crash were unsuccessful. Easy to use. It is incredibly easy to retrieve any file that has been deleted or corrupted with a couple of clicks of the mouse. It also makes it much simpler to store data held on servers, PCs, MACs or laptops based at any number of different sites. No set up charges. 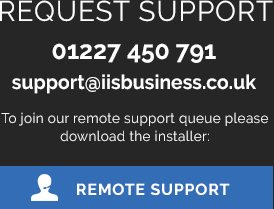 With Invicta IT Solutions, there are no set up costs and clients pay nothing until the service is fully operational. Keeps a local copy too. Not only is your data stored securely at UK-based data centres, you can also save a local copy on to a storage device. This gives clients two backup copies and a speedy way of restoring data if the unforeseen happens. Removes human error. No more remembering to replace the backup tape or take the removable drive off-site. Online Backup automatically stores your data every day and sends a daily summary of completed jobs. More secure. Online Backup uses 256-bit encryption so there is no risk that the data can be accessed by anyone without permission. Business continuity on a budget. Our Online Backup is not just a data store. If disaster strikes, our clients can keep working on their backup Microsoft Office files directly over the internet (via Terminal Services). For a small extra charge, you can even carry on sending and receiving emails to ensure you can survive the crisis.